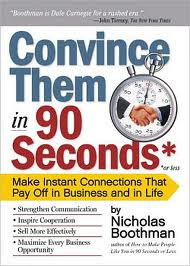 Convince them in 90 Seconds – Nicholas Boothman – Adventures in Networking! Fast read that is full of information you’ll use every day. Long version: Tell me WHY the best do this. Tell me the ONE SECRET to being the best. My current two questions when reading business networking books. I read every single one I can get my hands on and most are pandering drivel. Had to put three books down in the last month! This book however is consistently filled with the answer to these two questions. Some of the book made me mad because it propagates the type of networking I detest. It can seem a little slimy. There’s one whole chapter on “schmoozing”. But it was worth the read 100%. Boothman makes a promise on the cover “Make Instant Connections That Pay Off in Business and in Life”.